Elegantly Hand woven Black colored Maheshwari Cotton Silk Saree. Body of this saree is plain Black colored. 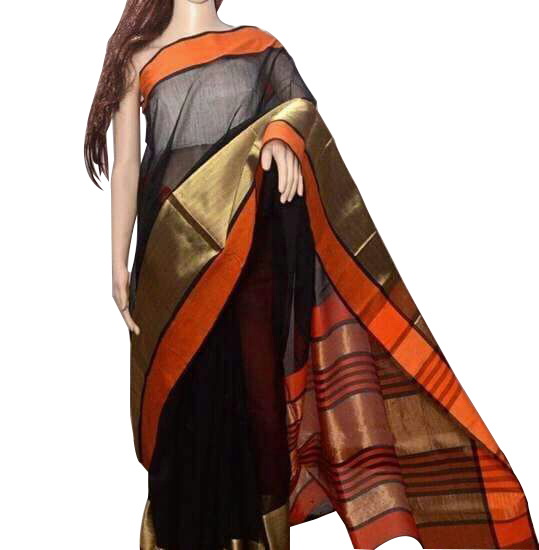 Lower border of this saree has a combination of thick Golden colored stripe with thin Orange colored stripe and the upper border has simple Orange colored stripe. Pallu of this saree is multicolored which has black colored stripes flowing on it. Contrast blouse piece comes along with this saree. Dry Cleaning is preferred for first wash. Subsequently hand wash this saree using cold water and mild detergents and dry this saree in shade. Queen Ahilyabai Holkar ordered crafts men of Malwa and Surat to create a new saree, wich later came to be known as Maheswari Saree. This saree was given as gift to the relatives and guests of the palace. This Black colored Maheswari Cotton Silk Saree is a perfect choice to carry the piece of history of Madhya Pradesh. This saree is suitable for all the occassions in your life.